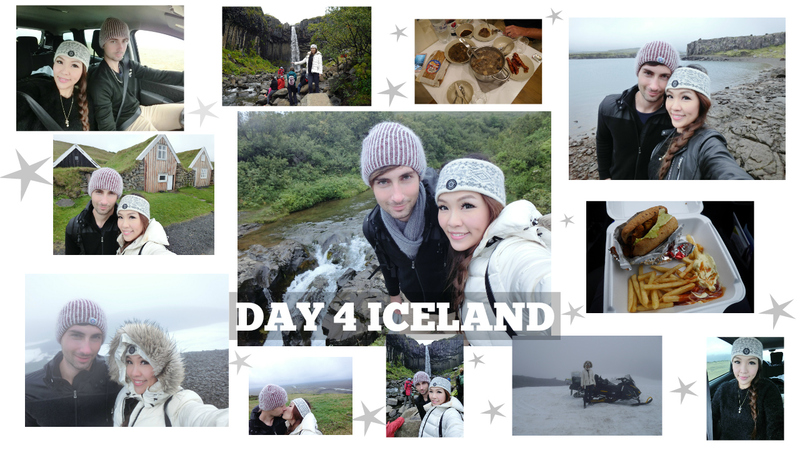 DAY 4 ICELAND: WE ATE POISONOUS MUSHROOM?! Day 4 in Iceland, we drove back the way about 45 mins to Vatnajokull National Park because the hotel around was full, so we booked one which is little far away from it. The weather was not good like usual, windy, cold and raining. Let's start our journey! Inside this building, there are books & a souvenir shop, a little cinema, an information center & toilets. A lot of people choose to do the glacier tour here, but you better book it online in advance. However, during this trip we didn't do any glacier tour. We did the hike to the Svartifoss waterfall. We found the Svartifoss waterfall! This waterfall also called black fall, probably because of the black stones behind! After visiting the waterfall, we walked the other side of the road to go back, climbing the stairs as on this photo. The opposite side on which we walked before. My husband picked a lot of bolets(mushrooms). We planned to eat them that night. We found an other bird! We decided to go to Sel to have a look before going back! We found these little houses in Sel. You can visit inside the house. Selfie with these little houses! We found 3 little horses. Half way to destination, we saw some ice! Finally we arrived at the top of the mountain where there is a restaurant. We didn't ride this, just took a photo! The weather was super cold and smoggy! We drove back and went back down! We stopped next to the lake and took some photos and shouted! This was our travel companion! This was our preferred one in this trip, but it was quite hard to find it because there is no any big logo or sign, just few little words on the door. We spent an hour to find it. Otherwise, it was a really nice apartment which was just renewed. Included the car park, wifi, double bed, kitchen, bathroom, toilet, TV and sofa. I like the kitchen style. We cooked the bolets that my husband picked and prepared the dinner. But after I ate few mushrooms, I felt unwell and dizzy. I told to my husband, he was so afraid and he felt the same. We just stopped eating. And he tried to call the local doctor but no one answered, he even wanted to call the police lol. It was really dangerous if we both just passed out, and no one will discover! After I felt so weak and head turning around, so I just fell asleep and I didn't tell to my husband because he was so afraid and nervous already. We were idiots and spent an hour to clean the mushrooms which were full of worms, it was super disgusting, and now when thinking back, how could we eat the mushrooms after seeing so many worms...=.=" We were crazy and out of our mind. We had a lesson which is never eat the self-picked mushrooms without an expert mushroom check! Fortunately, we were fine the following day, we did't vomit or stomach pain. We were still joking that if because of these stupid mushrooms something bad would have happened, the news title should be "A stupid couple ate poisonous mushrooms in Iceland during the travel", something like that...lol. We will never try it again and don't try it too!! It is really DANGEROUS!!! It is really a fantastic trip you re taking us with yo! Going straight to the video!